We here at Realeflow are of the belief that our success as a company is based on your success as a real estate investor. That’s why we are committed to being your technology partner by consistently updating Realeflow to make it more powerful, more user-friendly, and the most reliable tool for you to grow your real estate investing business and close more deals with. In the month of October, we rolled out a couple of big updates that we think you'll find useful and, frankly, pretty darn cool. We found it a little outdated and it had a tendency to cover-up important information. It also wasn't as mobile friendly as we would have liked it to be. Now when you log in, you'll find Realeflow's new side navigation, located on the left sidebar of the platform. With the addition of corresponding icons and a larger font, you can now easily find your favorite tools faster than ever, while still keeping the important information front and center. Our Knowledge Base and Support Request Form are located at the bottom of the main navigation. You can also chat with a member of our support team by clicking on the blue bubble in the bottom right corner of your screen. At the top of your screen, you'll find our new and improved search bar, which now includes a helpful auto-suggest feature. Use it to quickly find your saved properties and contacts. You will also notice the four icons to the right of the search bar. These icons give you the ability to quickly add new contacts and properties, access your favorites, navigate to your saved links, and view your notifications. This new side navigation will also make for a much more smooth mobile experience. Consider this the first of many changes for mobile that will be coming in the near future, making Realeflow more mobile friendly. Next up! An update that will have a huge impact for our Leadpipes Premium Users who depend on Realeflow's world-class property data & the leads it provides to fuel their businesses. We've combined our powerful Leadpipes data with property parcels, which means that we now have 140+ million geospatial polygons covering 99% of the U.S. population. Not only have we paired these polygons with Leadpipe's data, but we then layered this data on top of Mapbox's award winning mapping technology. Translation? We created powerful visualizations that give investors like you the ability to map out all of the high-profit real estate deals in your area so you can pick & choose the ones you want. You’ve heard of having a birds eye view? Well, this bird has supercharged high-intensity robo-vision. Simply enter your desired search location. The first thing you’ll notice is we’ve grouped our map navigation tools to one area for ease of use. Now in the bottom left of Leadpipes Premium, simply hit the 'Parcels' toggle to reveal the new parcel data in Realeflow. You'll see the map populate with all the results from your Leadpipes search. 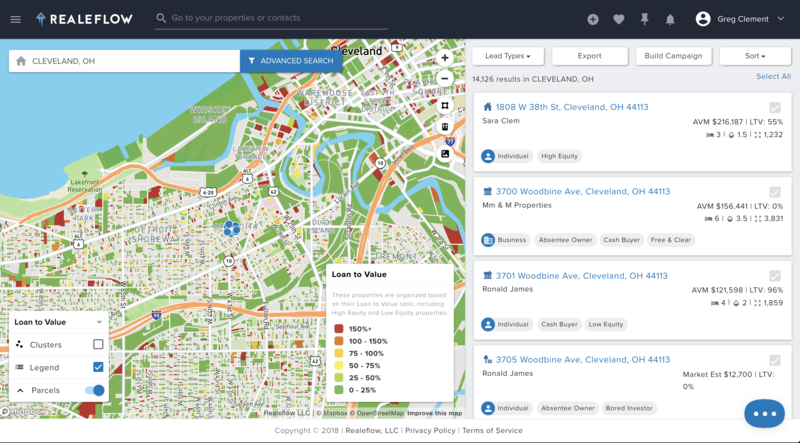 You have now have the ability to turn off clusters and select from multiple data sets like Vacant Properties where, at a glance, you would see a visual representation of vacant homes in the area. You can also choose from data sets like Loan to Value, Square Footage, Lot Size, Last Sale Price, and Cash Buyer. You can refer to the key to see a wider range of information, like the percentage for Loan to Value, for example. 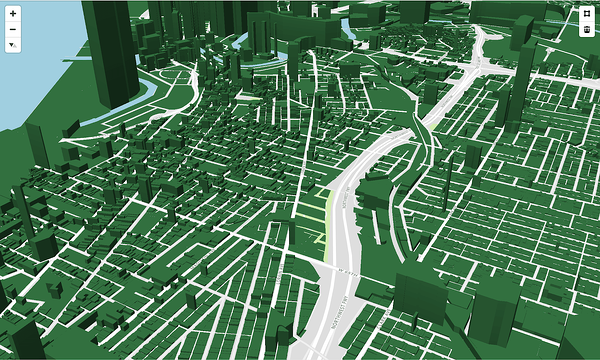 In the very near future, we'll be adding 3D overlays that will provide critical neighborhood & region analyses at a glance, and a ton of awesome surprises that we’re excited to tell you about next month. Here's a sneak peak of what it could look like.